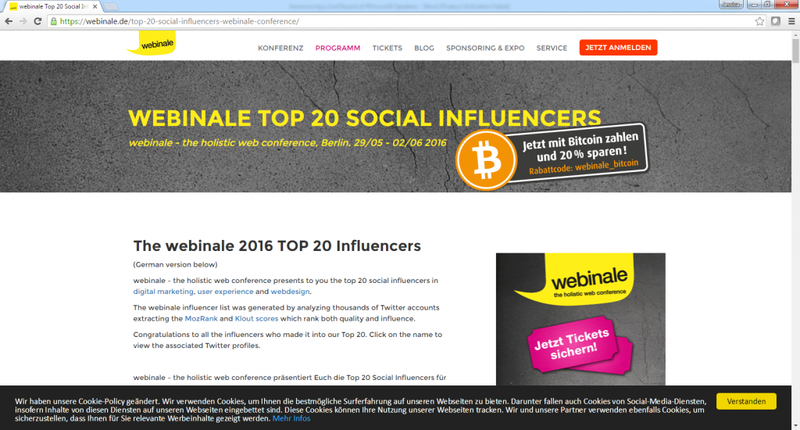 Webinale just announced their pick of the top 20 influencers of the year, and I made the list along with a slew of other incredible folks! For this German-based site, I was awarded a Klout Score of 82 and an overall score of 162. Webinale is a holistic web conference and scours thousands of Twitter accounts to figure out the top MozRank scores, Klout scores, and more in order to take an analytical approach to pinpointing the most influential Twitter users. Others on the list include Sam Hurley, acclaimed growth hacker and social media entrepreneur. There’s also Jeff Bullas, a content marketing influencer and social media strategist. You might want to follow Darren Rowse, speaker, author, and blogger extraordinaire as well as Danny Sullivan, a founding member of MarketingLand. I especially enjoy these fact-based lists that consider big data to provide concrete examples of who’s shaking things up in our digital space. This particular list also acts as a cheat sheet so you know exactly who to follow. I personally dish out a lot of advice on social media, including the tough lessons I’ve learned.